The Economist released an interesting chart on global military spending this week showing the increased spending on military assets by countries that have been considered in the past to not be pro-Western or an ally of the United States or EU. The largest spending boom was made by China. 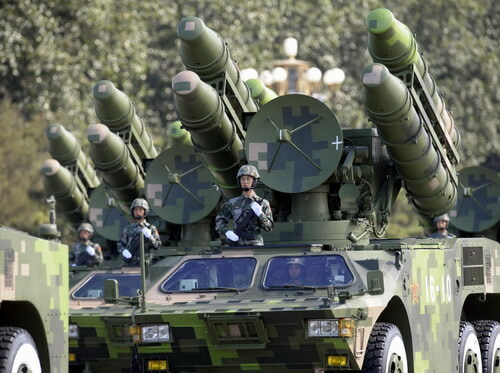 China has openly shown the People’s Liberation Army’s strength by rolling out new artillery systems and anti-aircraft systems ever since the 2009 military parade. The 2009 parade was significant as for the first time the PLA showed several new and tactically significant systems to the Chinese public and intelligence analysts all around the world. Russia, who is mired in a border dispute while slowly shaving off parts of the Ukraine has also shown a great increase in military spending. While Russia’s spending over the last few years is much less than that of China, the increased actions towards renewing a bad version of the Cold War since Putin was re-elected follows their spending trend. With the reticence of Western powers to engaged Russia in a hot conflict, Putin’s re-enforcement of Russia’s military forces might have paid off. What should be noted is that Russia, along with France and even the United States have made a lot of profit in selling weapons or their licenses to China, a variable that might have not been considered in the chart’s spending numbers. Military spending often reflects the trends in dangerous neighborhood. Saudi Arabia and the UAE have increased their spending by a significant amount, maybe hinting at their anxiousness at an emboldened Iran and continued violence in Syria that may affect the whole region to a much greater degree in the near future. India has also increased their spending as their ballistic missile policy changes and they arm against threats from China and Pakistan. Brazil has increased their spending as well. While not in a serious conflict with its neighbors, Brazil likely wishes to upgrade their forces while they have the funds to do so. Brazil will also be able to become more active in international security missions and participate with increased involvement in international aid missions with an increased military force. South Korea has increased spending as well since the unpredictable new young leader of North Korea came into power. Spending by many European countries have been reduced, and the United States and Germany only increased funding by limited amounts. When looking at the total budget of the Europeans and the United States, you can see the large discrepancy between the well funded U.S. military to that of China and Russia, showing the enormous difference between the U.S. and its next largest military rival. When looking at increased funding in China and Russia, it is no surprise that they are aware of the largess of the United States military, probably the most well funded military in human history. Funding for traditional security systems such as tanks, fighter planes and destroyers were displaced to a great degree in the post-Cold War era. Fighting insurgents in Iraq in urban areas were not well serviced by larger strategic weapons as Iraq’s army retreated, only to become insurgents fighting in the shadows of towns and villages after the last traditional war in Iraq. Fighting terror was not like fighting in a blitzkrieg war, and weapons systems such as IED resistant armored vehicles and drone technology were more of an adaptation to active problems in the field in one region of the world than traditional development programs, programs that often take over a decade to fund, research and produce. What was old may be new again however, as anti-aircraft systems with advanced technology seek to destroy drones as well as ballistic missile systems that are keenly accurate and designed to hit multiple targets in regional conflicts. This new technology and its ability to ramp up a conflict or diffuse it was demonstrated by the cooled response to rocket attacks on southern Israel that were checked by the Iron Dome system. Systems such as these will likely determine the future response by the U.S. and Europeans in Ukraine, and even change the game in Syria and Iran. Recently, Russia agreed to sell the S-400 Triumph system to China, and will likely send many of the TOR, BUK, PANTSIR and S-300 systems to Syria and Iran if Ukraine gets military support from the West. The effect of the Nazi’s invading Russia in the Second World War placed Russia on the clear path to ensure its own defense in the future, the evolution of this tragedy in modern times have created missiles and anti-missile systems that can promote or stop a war in many parts of the world.